Congratulations to our amazing franchisees on another outstanding year of security excellence and growth! On April 10th, just prior to the start of the ISC West trade show in Las Vegas, Nevada we held our annual spring owners meeting and franchise owners from across the country gathered for a day of meetings and networking before the exhibition opened up on the following day. 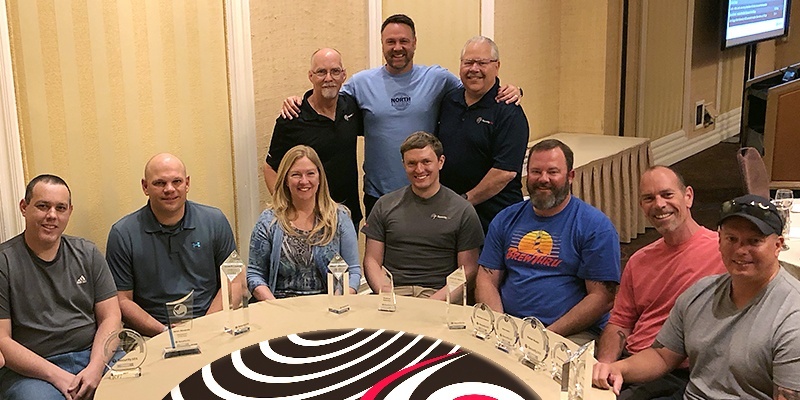 During this time each year, franchisees are presented with the coveted Security 101 Franchise Awards, where recognition is given to owners based on their successes from the previous fiscal year, 2017. The awards also included individual sales achievements by TEAM101 personnel consisting of several categories for sales excellence. Along with Tim Rose and Phil Bomeisl, I had the distinct honor of presenting this year's awards to the group. Here's how it all shook out! 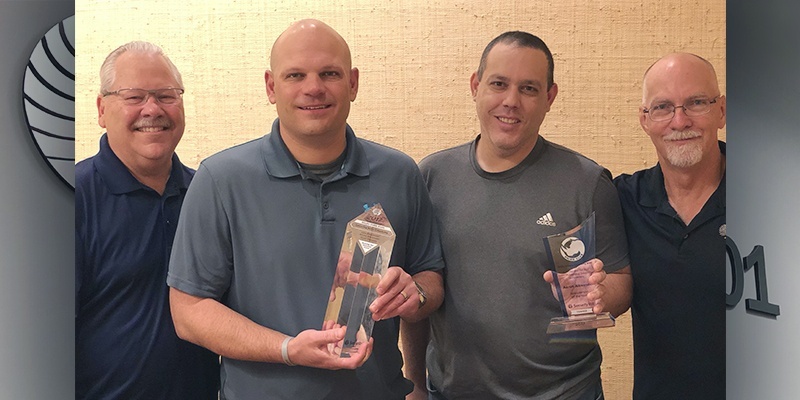 Security 101 – Charlotte joins the $10M Club and Aaron Alexander is awarded Salesperson of the Year. From left to right: Phil Bomeisl, Scott Robitzer, Aaron Alexander, and Tim Rose. Several Security 101 owners accept 2017 Franchise Awards. Seated from left to right: Aaron Alexander, Scott Robitzer, Susan Hunter, Matthew Netardus, Demus Oxford, Rob Ryan, and Rich Montalvo. Standing from left to right: Tim Rose, Corey Tyriver, Phil Bomeisl. Congratulations to Brad Bush of Security 101 – Tampa on his sales achievement of surpassing $1.5 million in sales. Demus Oxford, owner of the Security 101 – Richmond office celebrates winning the Sales Growth award for 2017. Congratulations to Felipe Betances of Security 101 – Fort Lauderdale on his sales achievement of surpassing $1.5 million in sales. Charlie Taylor, co-owner of Security 101 – Jacksonville presents James Damiano with a sales achievement award for surpassing $2 million in sales during 2017. 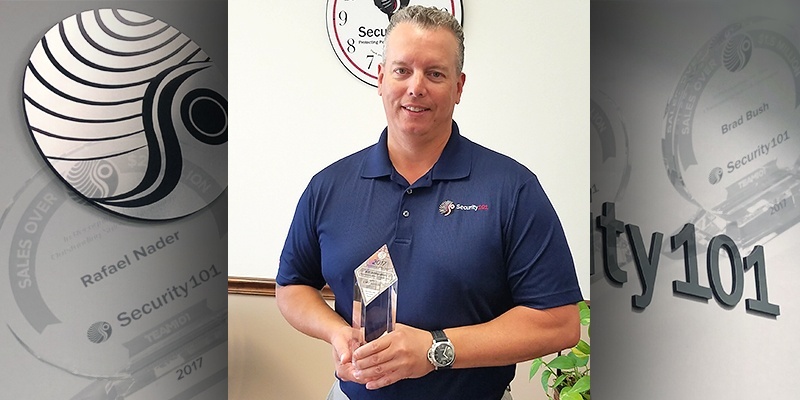 Jerry Brocki, owner of the Security 101 – Connecticut office was awarded Office of the Year for 2017. Congratulations to Matt Alden of Security 101 – Fort Lauderdale on his sales achievement of surpassing $1.5 million in sales. 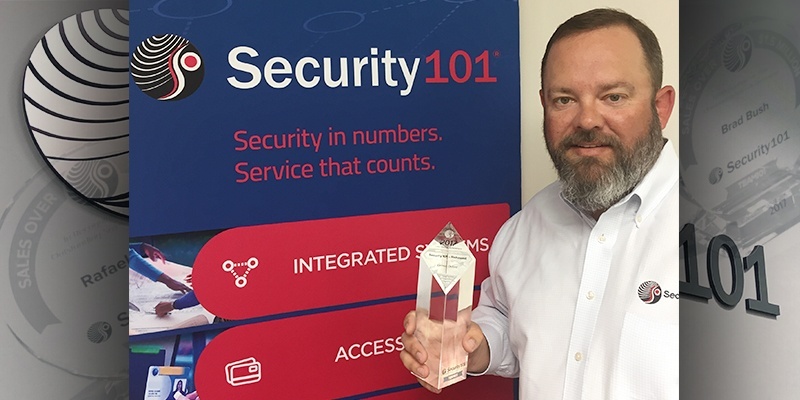 Rob Ryan, co-owner of the Security 101 – New Jersey and New York offices presented Matt Holland with a sales achievement award for surpassing $1.5 million in sales. From left to right: Michael Cintron, Matt Holland, and Rob Ryan. Congratulations to Matthew Netardus, co-owner of Security 101 – Hampton Roads on his sales achievement of surpassing $3 million in sales and induction into the Rhino Club for 2017. 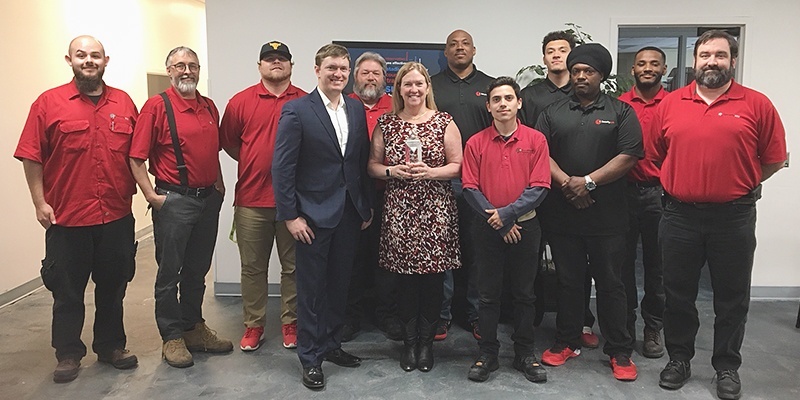 Co-owners of Security 101 – Hampton Roads, Matthew Netardus and Susan Hunter, brought home the crystal and gathered the troops for a photo to celebrate winning the 2017 Revenue Growth award. Congratulations to Rafael Nader of Security 101 – Miami on his sales achievement of surpassing $2 million in sales. 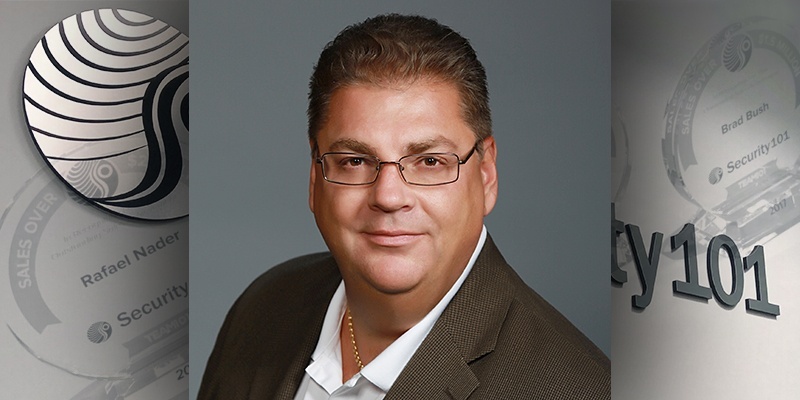 Franchise of the Year for 2017 was awarded to Rich Montalvo, owner of the Security 101 – Miami, Fort Lauderdale, Palm Beach, and Tampa offices. Ron Cluff of Security 101 – Salt Lake was presented with a sales achievement award for surpassing $1.5 million in sales. Pictured from left to right: Carl Berg, Director of Sales and Ron Cluff, Sales Director. Shannon Phillips of Security 101 – Charlotte was presented with a sales achievement award for surpassing $2 million in sales during 2017. From left to right: Tim Rose, Shannon Phillips, and Phil Bomeisl. Ready to earn your award? Are you ready for the next phase of your life where you are your own boss? Are you our next franchisee? Discover more about this amazing business opportunity. At Security 101 we are always on the lookout for the industry's top talent. If you think you have what it takes to make a difference in a competitive and exciting environment, then you should contact your local office and inquire about a position with TEAM101.